Ryan “Gootecks” Gutierrez lost every single one of his Street Fighter V matches during Eleague’s invitational last week. But, somehow, he emerged from that seven-string loss looking cool as heck. A full week later, Street Fighter fans still can’t stop talking about his sunglasses. The former Street Fighter veteran turned YouTube star has not been a competitive contender for years, so Gootecks’ losses at Eleague came as no surprise. But for the past week since he appeared on Eleague, Street Fighter fans have been sharing fan-art, memes, and even game mods featuring Gootecks clad in his distinctive Eleague look. None of the other fighters brought a costume and a persona with them into the ring. Though he’s long since exited the tournament, he’s still dominating the conversation. This isn’t the first time he’s become a meme, but it might be the first time he seems...well, cool. Gootecks has been leveling up his charisma by starring in YouTube videos. His “Excellent Adventures” web series with fellow Street Fighter veteran Mike Ross has been around since 2010. Despite his current appearance, unapproachable bad boy isn’t really Gootecks’ shtick. His persona on YouTube feels more like an affable everyman, a friendly neighborhood pal who just so happens to be really freaking good at Street Fighter. The trash talk on “Excellent Adventures” gets salty sometimes, but it steers clear of serious insults or slurs. (The hosts have pushed back against the few times their opponents have said slurs to them during games, such as in this early episode from 2011 when they met a sexist and racist jerk on the virtual battlefield.) It’s a friendly, feel-good show, considering the virtual beatdowns that take place. Gootecks brings the pain, but with honor—and a gentle sense of humor. That’s what made it so hilarious and surprising to see him amping up a performative mega-machismo act for Eleague. Gootecks, in sunglasses and a leather jacket? Gootecks, pouting in silence instead of smiling and making friendly conversation? Gootecks, putting on a massive pair of headphones and crossing his arms??? It was all so out of character, so far from the Gootecks we’ve all come to know online for the past seven years. So shocking! So corny! And yet… so cool. The Gootecks look has gotten retranslated into every possible cool character from every other franchise. 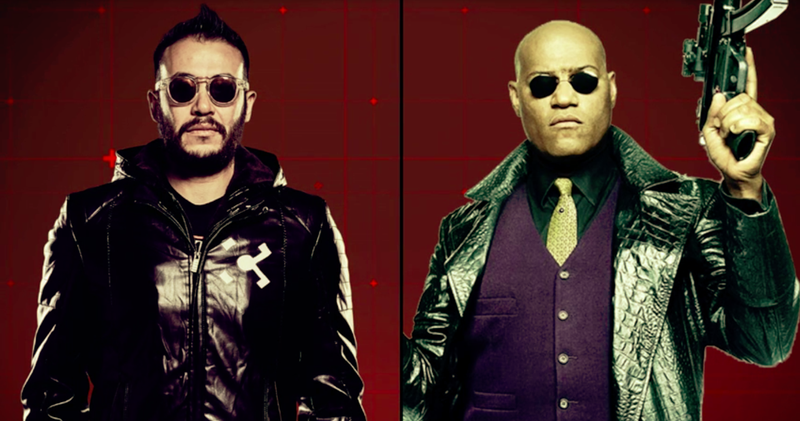 Eleague compared him to Morpheus from The Matrix and the Terminator, but Street Fighter fans have also been comparing him to everyone from Adam Jensen from Deus Ex to James Bond. James Bond doesn’t even wear sunglasses or leather, but stylizing Gootecks’ name as “G007ecks” looks cool and makes for good fun, so why not? But the references don’t always have to make sense. Sometimes it’s just fun to mash up Gootecks with another pre-existing meme. Or just draw a picture of him looking cool. And fans have been happy to play along, too. I’m sure Gootecks hoped that his fans would enjoy seeing him wearing a pair of sunglasses and putting on a show last week, but I doubt that even he guessed that they’d still be talking about it a week later. He’s the only Eleague loser who managed to turn seven losses into a big win for his personal brand—and for Gootecks, that’s what matters most for his career longevity. Time-traveling G007ecks will probably show up on YouTube, too, when the time is right.